Air pollution was the first major scourge that created the environmental movement. It sometimes gets lost in the discussions about climate change. They’re inter-related in many ways–but this is the point where we point out we’ve covered this at length over the years and our best service to you is to remind that educating oneself is a duty. And a service to one’s survival. Air pollution is choking the planet in many ways. While improved in some places and some ways–it’s worse than ever in many of the largest population centers and regression is occurring too often elsewhere. 7 million people die from air pollution every year–9 out of 10 people breath air with high levels of pollutants. That’s from the World Health Organization. And as usual, the children suffer the most. Coal is a top-of-the-list energy source that needs to be replaced–but there’s no magic fix when survival on other levels depends on it–until or unless there are affordable substitutes. Pondering the reality that we may need to use some sources that are far better in the short-term, even if less than ideal, as we hopefully race to the moon of an age of fully clean energy available to all, is part of the challenge that reality presents. We’ll leave that to your further study as well. In winter, coal stoves and power plants choke Mongolia’s capital, Ulaanbaatar, with smoke—and lung disease. ULAANBAATAR, MONGOLIA–Coal is everywhere in Mongolia’s frigid capital. It sits beneath the towering smokestacks of power plants in piles as big as football fields. Drivers haul it through town in the open beds of pickup trucks. Vendors stack yellow bags of the stuff along roadsides, and jagged pieces spill from metal buckets in the round felt yurts where the poorest families burn it to keep out the bitter cold. The smoke in Ulaanbaatar is at times so thick that people and buildings are visible only in outline. Its smell is acrid and inescapable. The sooty air stings throats and wafts into the gleaming modern office buildings in the center of town and into the blocky, Soviet-style apartment towers that sprawl toward the mountains on the city’s edges. On bad days, handheld pollution monitors max out, as readings soar dozens of times beyond recommended limits. Levels of the tiniest and most dangerous airborne particles, known as PM-2.5, once hit 133 times the World Health Organization’s suggested maximum. Mongolia’s pollution problem is a more severe version of one playing out around the world. From the United States and Germany to India and China, air pollution cuts short an estimated 7 million lives globally every year. Coal is one of the major causesof dirty air—and of climate change. In Mongolia, at least for now, coal is essential to surviving the brutal winters. But the toll it takes is steep. Ulaanbaatar has grown rapidly and in an unplanned way in recent years, as nomadic herders have left the countryside and settled on the city’s outskirts, in districts such as Dari Ekh. Living in gers or simple houses, they use coal stoves for both heating and cooking. Parents do what they can to protect their children from the smog. Here a mother adjusts her son’s mask before he leaves the family ger to walk to school. This winter authorities closed the capital’s schools for two full months, from mid-December to mid-February, in a desperate attempt to shield children from the toxic air. It’s unclear how effective that measure is. Hospitals are stretched far beyond capacity, as pneumonia cases, particularly among the youngest, spike every winter. One of Dr. Ganjargal’s patients is Gal-Erdene Sumiya, a shaggy-haired seven-month-old who, when I meet him, is just getting over pneumonia. 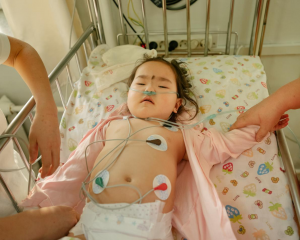 “I can’t bring him outside to get any air, because it’s so polluted,” says his mother, Selengesaikhan Oyundelger. She keeps her older children inside almost all the time too. Ger districts like hers, a mix of the traditional round tents and simple wood or brick houses, are home mostly to migrants from the countryside, former herders who have come to the capital seeking jobs and education. Because they lack the infrastructure available to apartment dwellers—reliable electricity and district heating systems, as well as water and sanitation—residents shovel coal into small stoves for warmth. A single family easily burns two tons or more each winter. Smoke floats from the metal chimneys that poke up from every tent and house, and the ger districts are among the city’s most polluted. But bigger polluters darken Ulaanbaatar’s air as well. Huge black plumes waft from power plants, and smoke drifts too from the chimneys of apartment buildings, supermarkets, and schools where maintenance men heap coal into big boilers. An air purifier stands watch over napping children at a kindergarten in the Bayanzurkh District. Young children are especially vulnerable to air pollution; the school has a purifier in every room. The blanket of foul air that engulfs this city for half the year is both a profound threat to its people’s health and a symptom of a much wider set of failures. Almost 30 years after it ended decades of isolation, rejected communism, and became a democracy, Mongolia remains a nation in transition. It has opened its rich mineral wealth to foreign mining companies that extract gold, copper—and, of course, coal—from the Gobi Desert. But it faces a tightening knot of problems: As environmental and economic changes have made the old nomadic way of life more tenuous, Ulaanbaatar’s leaders have failed to plan for the mass migration to the capital of rural families who are no longer able to eke out a living tending livestock on the high, windswept steppe. Mongolia is a nation of three million people inhabiting a space almost triple that of France—but nearly half are now crowded into its ever more polluted capital. Purevkhuu Tserendorj’s family didn’t migrate from the countryside; they returned to Ulaanbaatar in 2015 from Los Angeles, where she and her husband had been studying. They felt the pollution’s effects immediately. Their younger son was a newborn then, and he started coughing only a few days after they landed. Before long, he had pneumonia. Her friends told her their children got it several times a year, and soon her two boys did too. “It’s normal in Mongolia,” says Purevkhuu, a former television journalist. But she wasn’t prepared to accept such a serious illness as routine. So on Facebook she called for angry parents to gather on Sukhbaatar Square, where a statue of Genghis Khan sits in front of the imposing marble parliament building. It was December 2016, with temperatures below zero Fahrenheit. “The mothers couldn’t feel their feet and fingers,” Purvekhuu recalls. The movement that began that day has grown, but its founder is grappling with an awful dilemma. Her older son, now five, endured eye cancer as a baby in L.A. To protect his health, she and her husband sent him to live temporarily with his grandparents in Washington, D.C., and it’s agonizing to be so far apart. “Every morning I wake up missing, dreaming about him,” Purvekhuu says. At a refinery near Ulaanbaatar where moisture and some pollutants are removed from coal to make it a “cleaner” and more valuable fuel, a worker sweeping the floor wears a mask to shield him from the fine dust. Workers unloading the coal from trains at the refinery are sometimes engulfed in the stuff. Alex Heikens, UNICEF’s Mongolia representative, believes the air pollution here “is more than a public health crisis.” He sees it as a long-term threat to the nation’s well-being, scarring lungs permanently, impairing children’s brain development and endangering future productivity. “Even if we would stop the pollution now, we go down to zero today, many of these problems are already built into the health of the population,” he says. So far, the official response has been ineffectual, and many Mongolians have begun to see it through a wider lens. Anger over revelations of official corruption has roiled politics in recent months, toppling the parliamentary speaker in January. The word Manan is a mashup of the two main parties’ names, and critics use it to imply that there’s little difference between them, that both sides put personal interests first. The word also means “fog,” so it alludes to the lack of transparency that hides official misdeeds. And these days, Manan also refers to the unnatural fog of pollution. When it comes to pollution, experts say the remedy should start with providing better services to the ger districts, whose residents are both a big cause and the worst victims of pollution. One study found ger district children had lung capacity 40 percent smaller than kids in the countryside—a red flag for long-term health problems. While the ger districts have grown rapidly in recent years, they have been part of Ulaanbaatar for decades, and officials have neglected to provide even basic infrastructure. Ger families have enough electricity for light bulbs and a few appliances, but neither grid connections nor the city’s power supply are sufficient for them to switch to electric heating. Although most of Mongolia’s electricity comes from coal, at least big plants can be regulated, and their smoke treated, says Regdel Duger, president of the Mongolian Academy of Sciences. Insulating gers could halve the energy needed to heat each one, he added. He recommended the government provide loans to help ger owners fund such improvements. Recently, officials have sought to limit the ger districts’ growth by temporarily barring new migrants from coming to the city unless they can afford to buy or rent a home. “If you are going to move into the ger district and add more stoves,” says Deputy Mayor Batbayasgalan Jantsan, “then I’m sorry, we will not receive you.” Officials may introduce a fee for new arrivals when the migration ban expires, he said. Many migrants, though, simply come illegally. The forces driving Mongolia’s urbanization are powerful. Young people are pulled to the capital, as to cities around the world, by the prospect of jobs or better schooling. But Mongolia’s nomads are also being pushed off the land, as mining accelerates desertification of grasslands, through the mines’ heavy groundwater use and destruction of vegetation. Meanwhile climate change is increasing the frequency of the one-two punch of harsh weather known as the dzud: a dry summer followed by an even colder than normal winter. That decimates livestock and livelihoods. Even goats add to the trouble: Herders raise them for lucrative cashmere, but unlike camels, horses, and cows, they rip up plants by the roots, degrading pastures and ensnaring their owners in debt. Beyond efforts to curb migration, the government is also planning a shift to a higher-grade coal, barring the dirtiest grade of the fuel from entering the city starting in May. Tsogtbaatar Byambaa, a Ministry of Health official, expects that to help, but he knows there is far more to do. Much of the low-grade coal that fills Ulaanbaatar’s stoves, and that the government is outlawing, comes from Nalaikh, on the outskirts of the city. A state-owned company ran mining operations there until it collapsed in the 1990s. Now locals work the dozens of informal, unregulated holes that pock the landscape beneath the hulking shells of abandoned buildings. Muhammad Ashimset is only 18, but he’s been doing 12-hour shifts underground for three years. Each morning, he climbs into a battered metal bucket the size and shape of a bathtub, and as the cable holding it unspools, slides down a 200-foot-deep shaft. He and his co-workers send the big bucket up full, and crews shovel the coal into pickup trucks bound for the city. Soon that trade will end—legally, anyway. In the warm ger where the miners shelter from the bitter wind during breaks, they say they hope there will be new jobs for them if these mines are forced to close when the law requiring higher-grade coal kicks in. As another dust-covered miner pours salty milk tea into plastic bowls, Murat Ahambek says he understands the rationale behind that rule. After all, his family feels the effects of air pollution too. “My wife and my daughter, when they go home in the evening, they constantly cough,” he says. Many observers, though, doubt the move to refined coal will ease such symptoms. Sukhgerel Dugersuren, chair of a mining oversight group called Oyu Tolgoi Watch, says it’s long past time for Mongolia to shift away from coal altogether, not just to slightly better coal. But she sees little sign of the political will to make that happen. What’s more, she says, Chinese money is readily available to finance coal mines and power plants—but not clean energy. While China has invested heavily in renewable power at home, it remains dependent on coal and has been eager to tap Mongolia’s rich resources. Beth Gardiner is a London-based journalist and the author of Choked: Life and Breath in the Age of Air Pollution. Matthieu Paley is a photographer and frequent contributor to National Geographic. Follow him on Instagram.